Scone Films is a monthly pop‐up cinema. Screenings are generally on a Friday evening, but weekend matinees and social evenings are sometimes held. We are a not‐for‐profit community film group, organised by volunteers. Scone Films was established in 2009, following community forums identifying the need for access to cinema in the area. We screen recently released films as well as some not on general release, sometimes as part of a social evening. There have been many highlights including plenty of Australian films. Others include: The premiere of ABC River Stories – various tales about locals and their connection with the Hunter River. Screening of The Backpacker feature film shot locally in and around Murrurundi, and presented by the director. Scone Short Film Festival, our annual short film festival, is held a week before the N.S.W. Spring school holidays in September of each year. We pride ourselves in the quality of the Australian short films that fill our exciting program. Save these dates: 2019 – 21st & 22nd; 2020 – 19th & 20th September. Scone Films is a complementary addition to the vibrant and emerging arts scene in the Upper Hunter. We aim to enhance and increase the cultural activities already provided and offer a modern entertainment form for everyone that will complement the other artistic organisations in the region. Our Facilities at the corner of Oxford Rd and Cooper Street are a modern, well equipped multi-function centre utilised by a variety of community groups. The centre is on one level, facilitating easy access for all patrons. Over the past two years we have enhanced the cinema experience to include a cinema sound system, and a large 4.5 metre wide x 2 metre high screen. 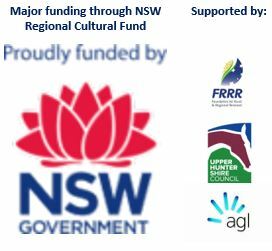 We have recently been the successful recipients of a NSW Government Regional Cultural Activity grant, which in addition to receiving support from the Foundation for Rural & Regional Renewal, Upper Hunter Shire Council and AGL Macquarie has allowed us to upgrade our cinema to Digital, along with cinema surround sound. This allows our patrons an authentic cinema experience without the need to travel from Scone. Thank you to all our supporters and regular filmgoers.